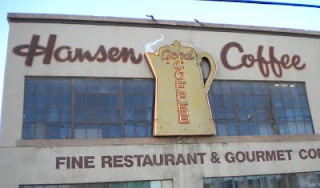 Not far from where the BART tracks dive underground between the West Oakland and 12th Street stations is Hansen Coffee. I don't know if they've been in the same location the whole time (most likely), but they've been around for over 100 years. On International Blvd. 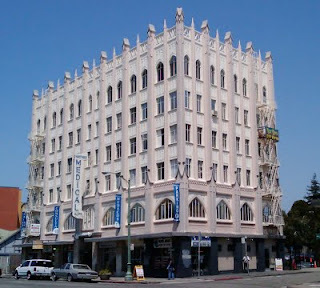 just up from Fruitvale is the beautiful Fruitvale Medical Building. Shining in the afternoon sun, you can see its gothic revival crenelations against the blue sky. It's the Talk of the Town. 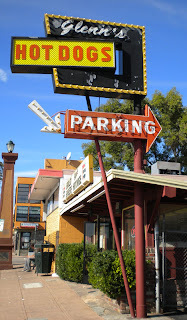 No, not continued furor over parking, but the bar on International just down from High Street. Glenn's Hot Dogs in the Laurel has a great combo of neon, chaser bulbs, and a rotating middle. 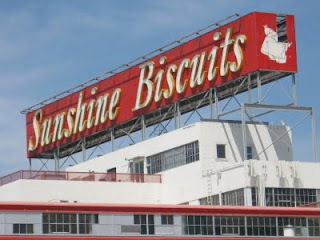 Any local residents know if it still lights up? It was 20 years ago today that the Loma Prieta earthquake hit and changed the lives of everyone in the Bay Area. 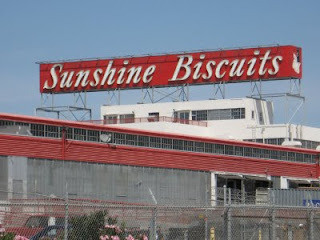 It also changed the landscape of West Oakland in a big way. Twenty years ago I was living and working in Berkeley for a software company on the top floor of what was then called the Great Western building (now the Power Bar building.) We felt a jolt and many of us stood up in the hallway, then the major movement hit. It's fortunate we stood up, because some of the shelves that were used for dividing the space into cubicles fell and the people in those cubicles would have been badly injured if they'd stayed at their desks. We had a good view over the Bay Area and could see much of the damage: the fire at Hustead's, the fires in the Marina district in SF, the collapsed section of the Bay Bridge (with binoculars). It was eerie to look down the side of the building, and see it gently swaying for some time after the shaking had stopped. Once the magnitude of the quake became apparent, people headed home or made other arrangements as best they could, since it was no longer possible to get to San Francisco without a major detour. No one was sure what they'd find when they got home. I didn't find out about the collapse of the Cypress Structure until I got home north of the Cal campus. It was stunning and horrific to hear about. I can only imagine what it was like to be there as it collapsed, or for the rescuers coming in after. In the months following the earthquake, the jumbled wreckage was demolished, and people started to discuss how to rebuild it. Local residents in West Oakland made it clear they didn't want the same thing built back. 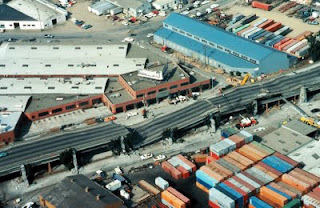 It took time, but 8 years later, a new connector was built, routed around the residential areas of West Oakland, and at ground level. No longer would a massive elevated freeway structure divide the neighborhoods. In the place of the old freeway, the Mandela Parkway was built at ground level, and features a wide green space in the middle. That at least was one good thing to come out of the earthquake. 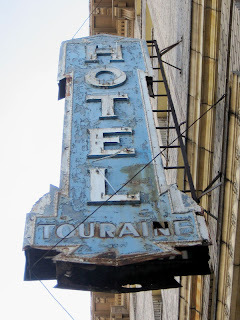 I've posted the sign for Hotel Touraine before, but I'd only photographed one of its signs before. 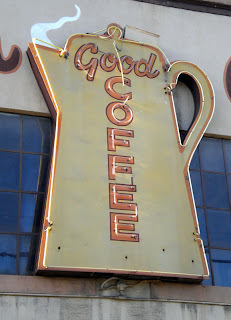 The second sign around the corner makes it worth a second look. A little ray of sunshine for this very rainy day. Yesterday was Oaktoberfest in the Dimond neighborhood. They closed off part of Fruitvale Ave. and MacArthur Blvd. with the Biergarten tent set up at the intersection. There were tons of people, and most all of them seemed to be having a good time except when the beer started running out. Most everyone was in good spirits, and were all the more delighted when some of the breweries restocked an hour later or so. It was a very Oakland event. There was good food, some by local vendors like La Farine and others who were there just for the event. People from all walks of life were there, making it a fun place to people watch. Lots of people were out with their kids or dogs or both, and it seemed like there was a lot to do for kids, including rock-climbing and face-painting. And some of the kids really enjoyed jumping or running to the music. It was a fun event. I think the event organizers need to plan for a bigger crowd next year. The same number of breweries, vendors and displays, but spread out a little more so the people are spread out a little more. Check out more pictures from Oaktoberfest. Update: Tim from the Dimond Neighborhood has posted some nice people pictures. And his links reminded me of something. A big thank you to the Two Star Market (near where the building housing Tepper's Hotel and biergarten still stands) for continuing to poor beer samples and wine when the breweries were running out. 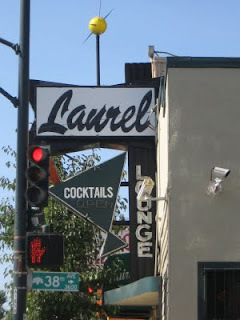 The Laurel Lounge sign has the requisite martini glass, though an interesting 50s or 60s style one. It also has the vaguely atomic or space-themed orb at the top. Unfortunately, a man was senselessly shot and killed near here last night. I'm not sure if this is the bar in question, or the 7 Seas across the street. Doesn't have the same ring to it as Habitat for Huge Manatees of The Simpsons fame. In any event, that's what I worked on a bit on Thursday at City Slicker Farms. I'd told one of the former Americorps members who helped build the coop about my visit a while back, and they mentioned that the coop gets too hot. Fast forward to this week, and I rode my bike over with my heavy duty drill and a largish Forstner bit to add some ventilation in the soffits. 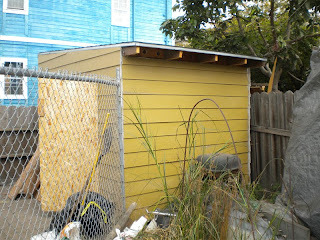 CSF still has some work to do on the yard, but they're hoping to have chickens for eggs by the end of the month. If you want to help, you can volunteer there on Thursdays and Saturdays -- check the CSF website for details. Today I was out for my usual Friday activity of working at Habitat for Humanity in the Sobrante Park neighborhood south of the Coliseum. A couple of big groups were out, one from Traveler's Insurance, and the other from Archstone. Thanks to them and the other volunteers, some good progress was made on the habitats for some Oakland humanity. On my ride down this morning, I had an awesome moment that still has me chuckling when I think about it. Along San Leandro Street, a youngster in the back of a car and I made eye contact and smiled. When I caught up with their car at the light, the guy in the passenger seat grabbed a mic (who has mics sitting in their car?) and started doing an ad-lib karaoke number to whatever was on the radio. The youngster in the back seat and I both got a good laugh out of it. The car zoomed off when the light changed, but I caught up with them again at the next light, and he did it again to the next song. As the car zoomed off for a second time, I yelled "encore!" and the guy yelled "have a good day!". Definitely made my morning. That's one of the things you miss by driving. 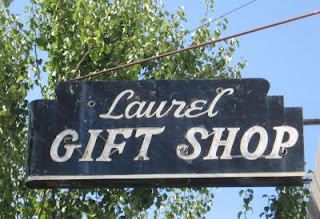 This simple sign in the Laurel looks like the 'Gift Shop' part might still work. Anybody know for sure? 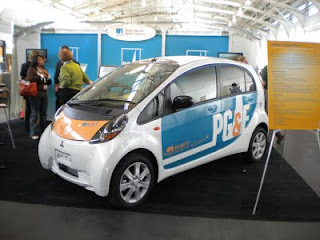 Last week I was at West Coast Green, a green building and design conference in San Francisco. Besides speakers on all sorts of green technologies, standards and legislation, there were two exhibit rooms of companies with green products, and a special section called the Innovation Pipeline with new and upcoming products. One of the more interesting displays was a portable, on-demand housing unit that's designed to shelter people in the wake of a disaster like Hurricane Katrina, and be zero-impact, too. It's an impressive unit that can be shipped anywhere in the world in a shipping container, and set up in two hours with unskilled people, and includes solar panels and water treatment. But even with a product like that, never mind expensive solar-power roof tiles or fancy countertops, it's easy to lose sight of people in the equation and just be looking at costs and carbon. That's why I was delighted to find one session titled Creating Social and Sustainable Economic Development in West Oakland, sponsored by the Home Depot Foundation. 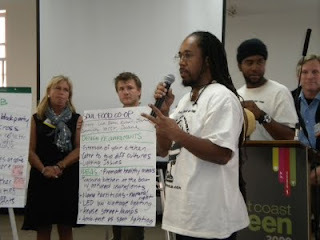 People with a wide variety of backgrounds came together with Ecocity Builders to brainstorm ideas for land use in West Oakland. But the kicker was that we weren't designing in a vacuum. People from Village Bottoms and A Black New World joined the discussion, and told us what their priorities and visions for the area were. 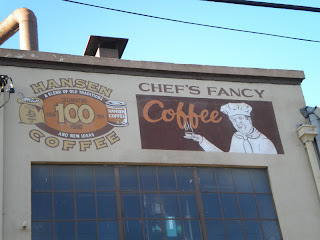 I knew a tiny bit about the area since I'd worked on some Habitat for Humanity houses nearby, and been to City Slicker Farms, but mostly we knew nothing but what a few briefs told us about the former Phoenix Iron Works site. So having residents there to work alongside was amazing and inspiring. We heard about Village Bottoms Farms, about the burgeoning artist community, and about the history of the area. Admittedly there was a limited amount we could do in 2 hours, but it was a great session, and a reminder that people are the most important part of the equation for any urban planning.